We pitched a session on business information at the Library Camp in the Mitchell Library last Saturday. 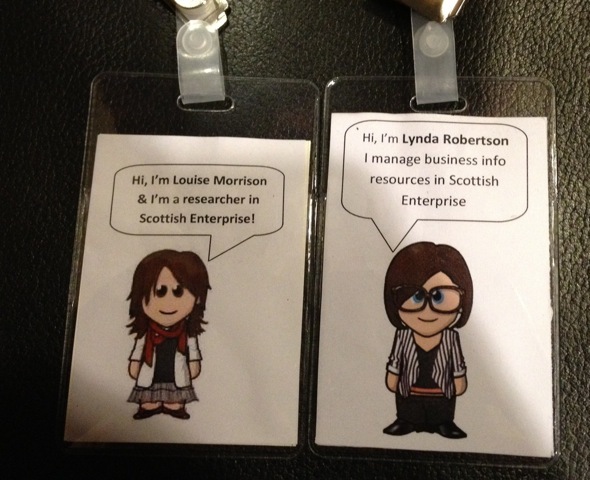 As we both work in the Scottish Enterprise Enquiry and Research Service, business information is a strong area of interest for us and we wanted to discuss the role that libraries and information services can play in driving Scottish business growth. For anyone who isn’t familiar with Scottish Enterprise, as a public sector organisation we work to support the development of competitive Scottish companies and Scotland’s growth industries. Our service is often the first point of contact for businesses and enquiries we receive can be varied. We can just as readily answer an enquiry from an individual with a business idea as a query from a large multinational company. To help us do this, the service has developed an electronic knowledgebase; putting the collective knowledge of the team and organisation in a single searchable and accessible place. A key strand of our service is providing research and information to Scottish companies. We help companies to identify opportunities, target new markets, and generally enable them to make informed decisions to grow their businesses. For instance, one day someone in the team might be working on finding out the size of the smoked sausage market in Belgium for a food and drink company who is considering exporting. The next day, we might be working to produce an in-depth piece of analysis on a major oil and gas company. The team have access to a range of subscription databases, but are also adept at sourcing information from online sources. It’s amazing the random pieces of information that you accumulate, which is one of the reasons that it makes the job so interesting and makes us good team-mates in a quiz! We were aware of a few other business information and advice services in Scotland including Business @ the Mitchell and SCOTBIS at the National Library of Scotland. We also knew that many Scottish public libraries offer access to business databases and publications. Outside of Scotland, the British Library Business & IP centre provides a range of information and advice services. Business information is, perhaps, a less traditional and more niche sector of library and information work but this seems to be a growing area. Under the ‘Enterprising Libraries’ scheme, a number of libraries across England and Wales have been given funding to set up a network of Business & IP centres modelled on the British Library. The scheme initially focused on core libraries in Birmingham, Leeds, Manchester, Sheffield and Newcastle but was recently expanded to an additional ten libraries. Business information is a growing area and there are probably not enough services to meet the level of demand. There should be more collaboration between the various business information services in Scotland. We should have a better understanding of what we all do and how we can help each other. One of the main barriers to delivering business information services is the high cost of market research reports and databases. This issue might be helped by better collaboration between business services. There are different ways of providing access to commercial market research information and each method has its own complications. Some services allow customers direct access to databases with restrictions, e.g. only a limited number of users can access a resource at one time or users must come to the library to access them. Other services do not allow direct access to resources but researchers will provide users with a limited proportion, e.g. 10%, of market research reports. There could potentially be more collaboration between businesses and academic institutions, e.g. the University of Strathclyde library provides corporate library memberships. Businesses might not know about all the services available to them and more could be done to target them. We were really pleased to chat with Kevan Smith (librarian at Business @ the Mitchell) and we are looking forward to working with him more in future. We’d love to hear from anyone else who works in the business support sector or has an interest in business information so please get in touch! CILIP Scotland special interest group. Find out how developments in Multimedia, Information and Technology are impacting on the library sector. « MOOCs – Opportunity or Threat for Librarians?